On their arrival and departure days, crews will eat meals in the dining hall. While on the trail, crews will pass through designated backcountry commissary camps every 3-4 days to pick up trail meals. Packaged in durable, recyclable plastic bags, these lightweight trail meals have been carefully developed to meet the dietary and logistical needs of backpackers at Philmont. Each meal bag feeds two people. In addition, most staffed backcountry camps have a “swap box,” where participants can leave unopened meal items or pick up additional items left recently by other crews. On the trail, each 12-day crew eats a total of 30 unique meals (10 days in the backcountry x breakfast/lunch/dinner). Meal schedules and labels are determined by the calendar date, rather than a crew’s day on their trek (for example, every crew eats B1, L1 and D1 on the 1st, 11th, and 21st of each month; every crew eats B2, L2 and D2 on the 2nd, 12th, and 22nd, etc.). Every trail dinner is a cooked meal; however, all lunches and most breakfasts are designed to be eaten while hiking, if desired. Learn more about how to cook and clean in the backcountry on our Backcountry Cooking page. Learn more about your dining options with allergies, religious food needs, or other dietary restrictions. You can view the most recent ingredient list for breakfast, lunch and dinner trail meals, as well as Chuckwagon and Abreu Dinner below. Trail meals are by necessity a high-carbohydrate, high-calorie diet rich in wheat, milk products, and sugars. You can learn more about food substitutions and dietary concerns from our Commissary’s Special Food Needs Document. sent ahead for your crew to pick up along with your normal trail food at commissary camps along your trek. **Meal schedules and labels are determined by the calendar date, rather than a crew’s day on their trek (for example, every crew eats B1, L1 and D1 on the 1st, 11th, and 21st of each month; every crew eats B2, L2 and D2 on the 2nd, 12th, and 22nd, etc.). 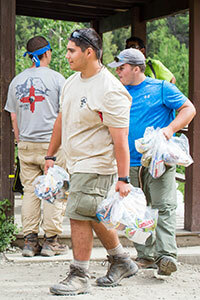 Learn more about how to purchase surplus Philmont trail meals.